Scientists announced on Wednesday, in a paper published in the journal PLOS ONE, the discovery of the remains of a 3 feet long dinosaur in the Gobi Desert in western China’s Xinjiang Province. They named it Hualianceratops wucaiwanensis and it lived about 160 million years ago late in the Jurassic Period. 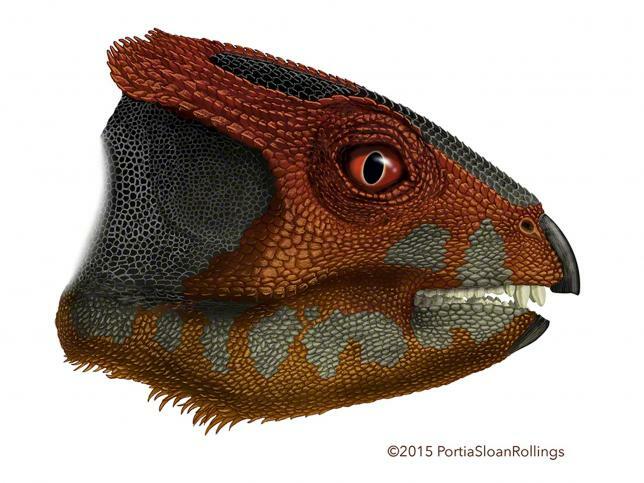 The species is an early Triceratops relative, one of two ceratopsians discovered by the same team of researchers. In 2002, paleontologists James Clark of George Washington University and Xu Xing from the Chinese Academy of Sciences named the oldest of the “horned dinosaurs” family Yinlong downsi. The newly named Hualianceratops wucaiwanensis, meaning “ornamental face”, is similar in age to the oldest-known member of the “horned dinosaurs”, the Yinlong downsi, although both are hornless. Ceratopsians did not become quadrupedal and did not acquire their trademark horns until tens of millions of years later. It stood on its back legs and it was a slightly shorter, chunkier version of Yinlong downsi. Both ceratops species were found in the same fossil beds in Xinjiang Province. “Finding these two species in the same fossil beds reveals there was more diversity there than we previously recognized, it suggests that the ceratopsian dinosaurs already had diversified into at least four lineages by the beginning of the Jurassic Period.” study co-author Catherine Forster said in a press release. Moreover, Hualianceratops wucaiwanensis lived at the same time and place as Guanlong, an early relative of Tyrannosaurus rex. It’s possible that Guanlong hunted Hualianceratops wucaiwanensis, but scientist said they need more evidence to say for sure. Scientists also believe that given the pattern of relationships revealed by the new animal and new analysis, there could be many more, and more varied, species of these small, horned dinosaurs during the initial evolution of this group. Scientists also identified a separate new species of dinosaur known as the Kunbarrasaurus, a creature about the size of a sheep which had a parrot-like beak, bones in its skin like a crocodile, and an inner ear similar to a turtle. The dinosaur is a type of Ankylosaur, group of four-legged, herbivorous dinosaurs, closely related to stegosaurs. Life expectancy stalls while drug overdose deaths rise in the U.S.